Deliciously dark and rich organic best bitter, handmade at Untapped Brewery, Monmouthshire. Brewers Marty and Owen use Northdown hops for this traditional dark ale: bitter and aromatic, they offer a clean counterpoint to the powerful malt, and bring every sip to a balanced fruity finish. 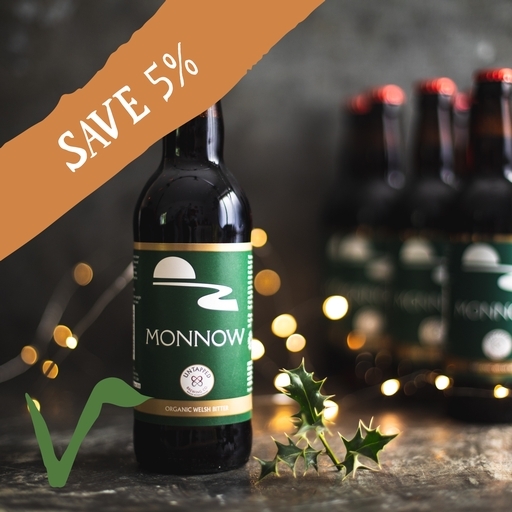 12 Untapped Brewery monnow ale 50cl: Alcohol 4.2%, Suitable for vegans. Untapped Brewery is the home of the ‘homeless brewers’; or so old friends Marty and Owen used to be known. They knew they wanted to start brewing beer together, but couldn’t afford a brewery – so in 2009, they charmed their way into borrowing someone else’s. Their goal was simple: to create home-grown, handmade beers that ‘refresh the wits and feed the soul’. Their tasty beers have earned a loyal following, and Marty and Owen now have their very own brewery in Raglan, Monmouthshire. Untapped Brewery monnow ale: Barley, water*, yeast*, hops.